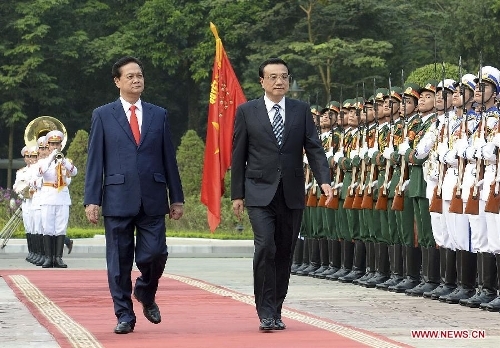 Chinese Premier Li Keqiang arrived in Hanoi on Sunday for his first official visit to Vietnam as premier, with dialogue on the South China Sea and deepening economic ties between the two countries, which share a long and complicated history, topping the leader's agenda. 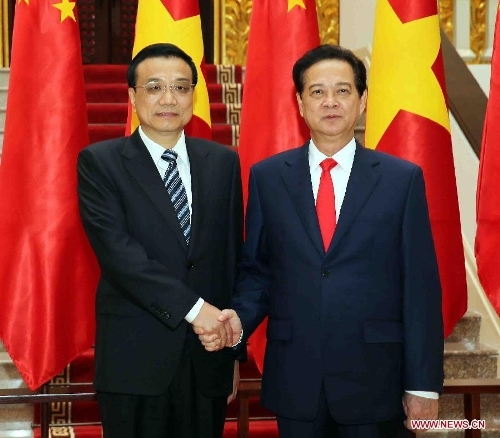 Li and his Vietnamese counterpart, Nguyen Tan Dung, agreed on Sunday to further deepen the partnership between their two countries simultaneously along the three tracks of maritime, onshore and financial cooperation, the Xinhua News Agency reported. The two sides agreed to establish a joint working group for each of the tracks within the year. Li highlighted maritime cooperation, saying it is a positive signal that the two neighbors are willing to solve the difficult problem through cooperation. According to Li, a group will be built to promote joint development on the sea. 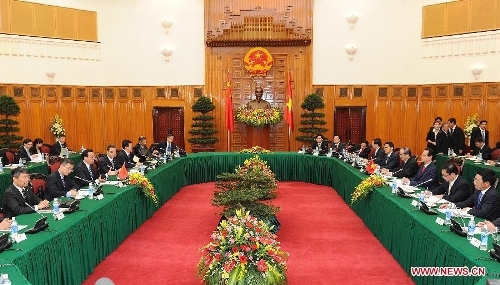 Meanwhile, another cooperation program already underway in waters outside the mouth of the Beibu Bay, a semi-enclosed body of water whose delimitation remains under negotiation between China and Vietnam, would be further pushed forward to seek substantive progress. The socialist neighbors have shared a complicated path in their relationship, including fighting a one-month-long war along their border over a territorial dispute in 1979. Du Jifeng, a research fellow at the Institute of Asia-Pacific Studies of the Chinese Academy of Social Sciences, told the Global Times that on the one hand, Vietnam relies on China economically, but on the other, it retains some doubts on China's rise. While the two countries have settled the issue of land demarcation, disputes over territorial claims in the South China Sea have bothered both sides in recent years. "[The two countries] should work out innovative ideas to solve the dispute in the South China Sea, which is the only remaining historical issue in bilateral ties," Li told Dung. "Vietnam has tried to pull the US and Japan into its dispute with China in the South China Sea and internationalize the issue," Bi Shihong, a professor with the School of International Studies at Yunnan University, told the Global Times, but he added Vietnam still wouldn't go too far in the dispute. In a sign of warming ties, this year has seen frequent high-level contacts between the two countries. 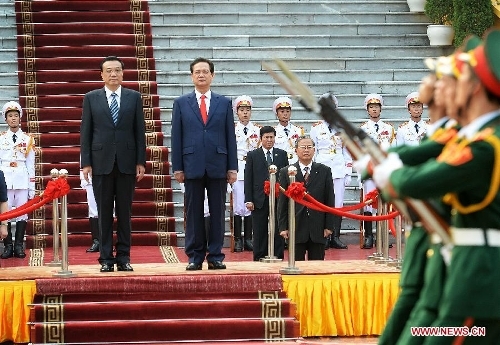 Vietnamese President Truong Tan Sang paid a visit to China in June, and Prime Minister Dung also traveled to the southern Chinese city of Nanning for the 10th China-ASEAN Expo in early September. 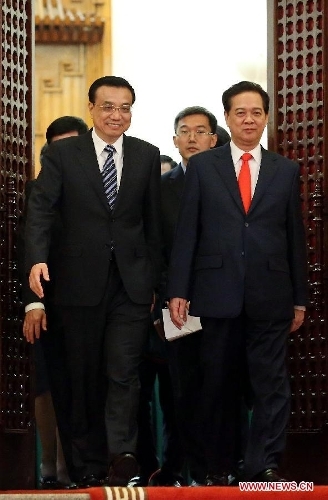 In his meeting with the visiting Vietnamese president in June, Li called on the two sides to refrain from unilateral moves that would escalate or internationalize the South China Sea issue and cause unnecessary troubles in bilateral cooperation. Sang also agreed that Vietnam and China should manage and resolve sea-related issues through friendly consultation, advance maritime cooperation step by step, reduce their differences, increase common interests and thus pursue common prosperity. In addition to maritime cooperation, the two leaders Sunday also vowed to push for cooperation in boosting interconnectivity, economy, trade and investment as well as finance. A joint team will be set up to mull the signing of agreements on bilateral currency swap and settlement. The two countries aim to strive for a balanced growth of bilateral trade and achieve in advance the goal of raising their trade volume to $60 billion by 2015. The figure was more than $50 billion last year. Following Sunday's talks, Premier Li and Dung also attended signing ceremonies for a number of cooperation documents in maritime, economy, trade, infrastructure and other fields. Vietnam is the last leg of Li's first Southeast Asia tour as premier, which has taken him to Brunei and Thailand. While in Brunei, he attended a series of East Asian leaders' meetings and expounded China's policy on promoting regional cooperation and development.